GREENWOOD VILLAGE, Colo. and LONG BEACH, Calif. – March 20, 2018 – Are you looking for a simpler way to meet all your scanning and document management needs? As business information continues to grow at unprecedented rates, document management resellers and dealers are key partners helping organizations securely protect and manage critical data. Digitech Systems announced today they have recently certified their PaperVision Capture (advanced capture) and PaperFlowTM (desktop scanning) applications with the Epson WorkForce DS-770 and DS-575W Wireless color document scanners. The certification adds more reseller opportunities to the company’s existing partnership. Now, more than a dozen Epson scanners, encompassing all four of their scanner lines (mobile, desktop, workgroup, and flatbed) are certified to work with Digitech Systems’ information management software and cloud services. Resellers can take advantage of special combined solution packages to solve more complex information challenges for businesses. Epson scanner customers will have access to sophisticated indexing capabilities in PaperVision® Capture and can easily upload scanned documents to PaperVision® Enterprise, the on-premise Enterprise Content Management (ECM) system, or to ImageSilo®, the cloud ECM service. Digitech Systems’ award-winning, artificial intelligence (AI) enabled classification and data extraction tool, PaperVision® Forms Magic further simplifies an organization’s ability to access and use information contained in scanned documents by automatically identifying and extracting key data. Together, the products virtually eliminate manual data entry and can dramatically reduce the costs associated with securely managing and accessing critical business data. Information that used to be trapped in paper files can be securely accessed on virtually any device anytime it is needed. Business processes, such as accounts payable and human resources, can be automated by sending extracted data to line-of-business applications and automating the flow of documents through review and approval processes using PaperVision® Enterprise WorkFlow, resulting in a fully automated business. 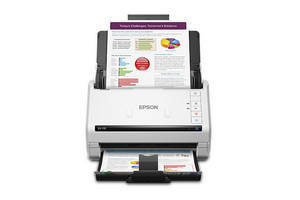 The Epson DS-770 and DS-575W color document scanners are versatile workgroup sheet-fed scanners with varied feature sets designed for a wide range of markets – from insurance and legal to healthcare and finance. Delivering scan speeds of up to 35 ppm/70 ipm and 45 ppm/90 ipm, the DS-770 and DS-575W offer robust duty cycles, scanning up to 4,0002 and 5,000-sheets per day, and can hold up to 50 and 100 pages in the built-in Automatic Document Feeder (ADF). Both scanners also come equipped with TWAIN and ISIS® drivers for seamless integration with existing third-party document management software, such as Digitech Systems’ PaperVision Capture and PaperFlowTM applications. In addition, the DS-575W offers wireless capabilities for scanning to smartphones, tablets, computers or online storage accounts. Led by the Japan-based Seiko Epson Corporation, the Epson Group comprises more than 80,000 employees in 86 companies around the world, and is proud of its contributions to the communities in which it operates and its ongoing efforts to reduce environmental impacts. Epson America, Inc., based in Long Beach, Calif., is Epson’s regional headquarters for the U.S., Canada, and Latin America. To learn more about Epson, please visit: epson.com.